Bishop Peter James Lee has been appointed to another prestigious post since his retirement from the Diocese of Virginia in 2009. He has served as both the interim dean of Grace Cathedral in San Francisco (2009-2010), and as the interim dean of General Theological Seminary in New York City (2010-current) and has now been appointed as interim dean of the American Cathedral in Paris. He is slated to take the post in early 2012. In addition, Bishop Lee will be awarded the 2012 Distinguished Service Award by the First Freedom Awards based in Richmond, VA. He will receive the award in January 2012. 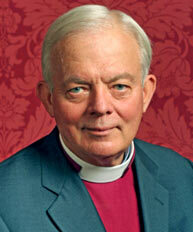 Bishop Lee served as the 12th bishop of the Diocese of Virginia for 25 years, a time that saw his diocese become the largest Episcopal diocese in the United States. Bishop Lee worked hard to find a reconciling path during a very difficult period of division in the Diocese of Virginia with the creation of both the Diocese of Virginia Commission on Reconciliation (2004-2005) and his landmark Special Committee (2005-2006) which created the Protocol for Departing Congregations and was chaired by the late Russ Palmore. Fifteen Episcopal congregations voted to separate from the Episcopal Church following the protocol, however a difficult and costly path of litigation and inhibition was authorized following the elevation of Katharine Jefferts Schori to Presiding Bishop in November 2006. Bishop Lee's new position and award may publicly coincide with the long-awaited announcement by the Circuit Court of Fairfax in Virginia regarding the ongoing congregational property litigation. Judge Randy Bellows will hold one more public hearing in his court some time in late October or early November before issuing his final ruling on the fate of the church properties. What is the October/November hearing for? +Lee has indeed been treated quite well since leaving Virginia -- perhaps TEC's gratitude for pursuing litigation? The hearing will be an opportunity for counsel to answer Judge Bellows' questions before he hands down his decision. The bishop of my confirmation on the feast of William Laud in 2006; may God bless and keep +Peter Lee. We are known by our fruits. Sadly, tragically, Peter Lee will be known for years to come for his duplicity and cowardice, bowing to the demands of "the new sheriff" who came to town in the person of Katherine Schori. So much sadness, so many dollars, all because he wouldn't keep his word. Not much of a Virginia gentleman, after all. And isn't the American Cathedral the church that Camus came to in the last years of his life? A better story, really, worthy of Peter Lee's meditation. Unlike most, Camus was willing to look the dragon of his unbelief in the eye, and not blink. But he also knew that if there really was a God, then that would change everything. Everything. We are all always hobbits, muddling through, even with great tasks to take up. There is no final judgment here, as that is God's to do-- but I do lament, and I do groan over any honoring of Peter Lee, as he has not been very honorable. Perhaps he was just tired - tired of watching the decline of his own diocese and, just maybe beginning, to wonder if he bore responsibility. I will offer the counterpoint to AH's 0857 comment. I believe Peter Lee to be an honorable and honest man of God. I can't prove it in any objective sense any more than AH can prove that he is a lying, dishonorable coward, but my version that has been my limited personal experience with the man. And it feels better to say it than it does to vilify the man (I hope). For yet another voice from the Diocese of Virginia, visit my blog at http://allsaintsepiscopalmusings.blogspot.com. Views are entirely my own and may or may not reflect those of the diocese or my parish.